comment Save £££ on unlimited admission to 2 Parks in 1 day with a flexible ticket valid for six months within 6 months of purchase. The Dubai Parks and Resorts 1 Day/2 Park Ticket gives you full day unlimited access to any two theme parks, the choice is yours! 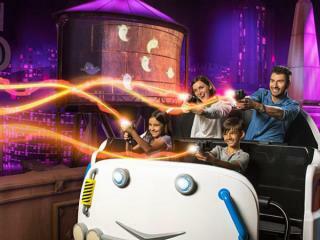 Pick between MOTIONGATE™ Dubai, Bollywood Parks™ Dubai, LEGOLAND® Dubai or LEGOLAND® Water Park and experience the wonders of two world-class theme parks featuring over 100 rides, shows and attractions. Tickets are open-dated and can be activated at any time within 6 months of purchase and fully flexible so you do not need to decide which two parks to enter until the day of your visit. Embark on a Hollywood-inspired adventure that will take you beyond the screen at MOTIONGATE™ Dubai™. Step into the magical, mythical worlds of some of cinema’s most beloved movies and explore three legendary film studios in one theme park – Columbia Pictures, DreamWorks Animation and Lionsgate (coming soon). Get ready to be transported into the world of movies such as Shrek, Kung Fu Panda, Hotel Transylvania, Ghostbusters, The Smurfs and The Hunger Games. Continuing the cinematic experience, explore the first theme park to showcase the authentic Bollywood experience. At Bollywood Parks™ Dubai, themed attractions and rides spread across five zones recreate the Bollywood experience allowing you to live, learn and experience the kaleidoscopic world of Mumbai’s famous film industry. You will aso have a chance to see the first Broadway-style Bollywood musical at the iconic Rajmahal Theatre, the heart and soul of Bollywood Parks™ Dubai. How about a perfect day for the whole family? The well-known LEGO® brick comes to life in a unique interactive world of LEGO themed rides, shows and attractions specifically designed for children aged 2-12 and their families. At LEGOLAND® Dubai, children can stretch their imaginations to become the ‘heroes’ in a fun day for the entire family. Featuring over 40 interactive rides, shows and attractions and 15,000 LEGO model structures made from over 60 million LEGO bricks, you will find six themed lands, each unique in their experience, entertainment and educational offering. Splash into a world of LEGO® adventures at LEGOLAND® Water Park, the regions only water park designed for young families. With over 20 LEGO themed water slides and attractions, it's the most splashtastic family day out! All parks are connected by Riverland™ Dubai, a uniquely themed retail and dining destination at the heart of Dubai Parks and Resorts. Dubai Parks and Resorts 1 Day/2 Park Ticket is open-dated and MUST be used within six months from the date of purchase. You will receive a gate-ready a gate-ready Dubai Parks and Resorts 1 Day/2 Park E-Ticket that must be printed on receipt. Upon arrival, simply scan the barcode at the gate for admission to the parks. This ticket will give you same day admission to your choice of 2 (two) theme parks, including LEGOLAND® DUBAI, LEGOLAND® Water Park, MOTIONGATE™ DUBAI and Bollywood Parks™ Dubai. All guests entering Dubai Parks And Resorts are subject to the rules and regulations of entry as displayed at the main entrance and within Guest Services. Height, weight, size and age restrictions and medical warnings apply to certain rides and attractions. These will be displayed at each relevant ride and attraction and made available from Guest Services. Children below 3 years old may enter the theme parks free of charge and do not require a ticket. However, children under the age of 3 visiting LEGOLAND® Water Park must pay a minimal fee, which includes swimming diapers. This is paid locally. Dubai Parks And Resorts, in its absolute discretion, reserves the right to vary the opening and closing dates and times of the attractions and to close, remove or cancel all or any part of the rides, events or facilities within the attractions for any reason including, but not being limited to technical, health and safety and/or operational reasons or due to special events or private functions. Ticket does not include parking fees, and parking is subject to availability. Parks, zones, attractions or entertainment may change operating hours, close due to refurbishing, capacity, weather, or special events, and may otherwise change or be discontinued without notice and without liability. Currently not all the attractions and areas of MOTIONGATE™ Dubai are open to the public. The DreamWork Zone is in technical rehearsals and rides are subject to closure without notice. Can I visit all of the other Dubai Parks and Resorts attractions in 1 day? Your ticket gives you unlimited same-day access to 2 parks, and you MUST choose between MOTIONGATE™ Dubai, Bollywood Parks™ Dubai, LEGOLAND® Dubai and LEGOLAND® Water Parks. Do children below 3 years require an admission ticket? Children under the age of 3 can enter the parks for free. Children under the age of 12 must be accompanied by an individual aged 18 years or over. There is a minimal fee for children under 3 visiting LEGOLAND® Water Parks, which includes swimming diapers. This is paid locally. Is Dubai Parks And Resorts open all year round? Yes. Dubai Parks And Resorts is open 365 days per year.